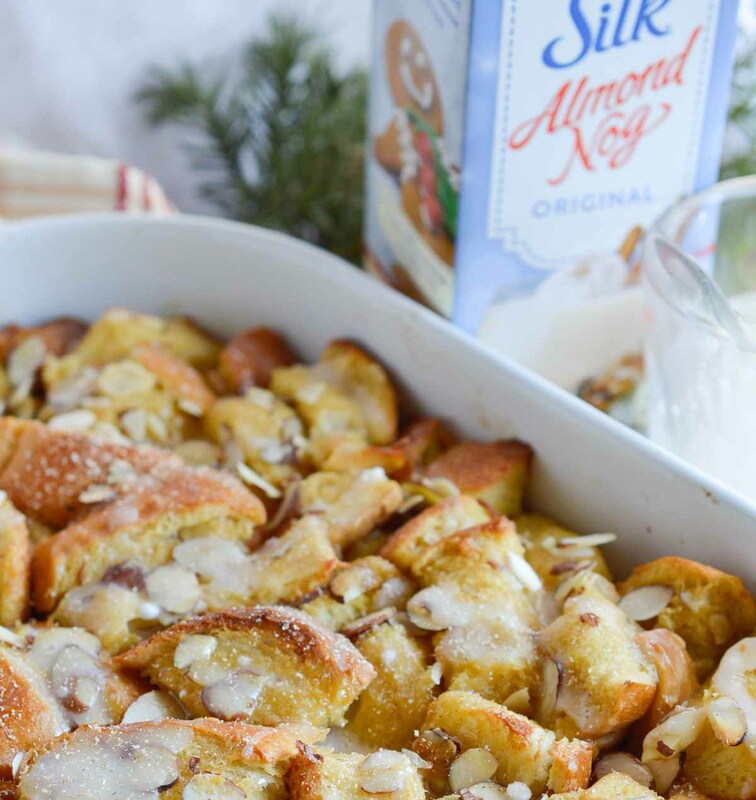 This Dairy Free Almond and Egg Nog French Toast Casserole with egg nog glaze is perfect for feeding a crowd this holiday season! 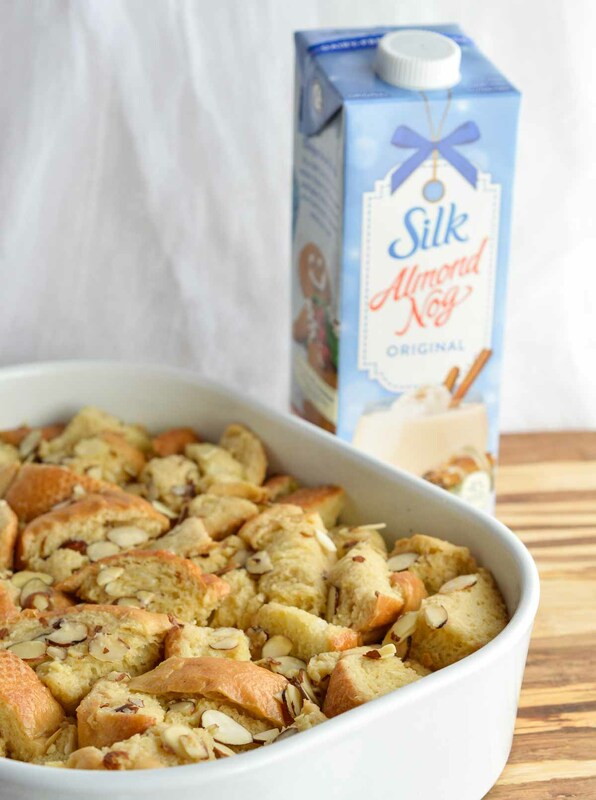 I am proud to be partnering with Silk to bring you this tasty holiday recipe! 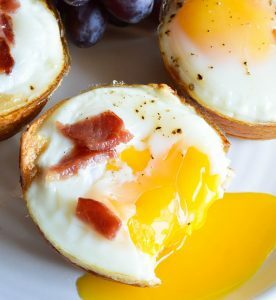 As I have said before, I just LOVE easy breakfast recipes! You know, because I am not a morning person. So if it ain’t easy . . . it ain’t happening. But really I guess I’m not just limited to breakfast. 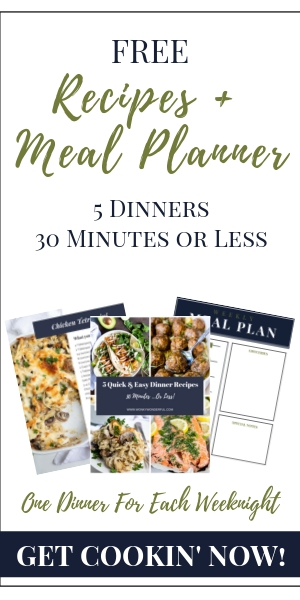 My recipes are almost exclusively quick and easy. I enjoy cooking and baking, I just don’t have hours upon hours to spend in my kitchen. 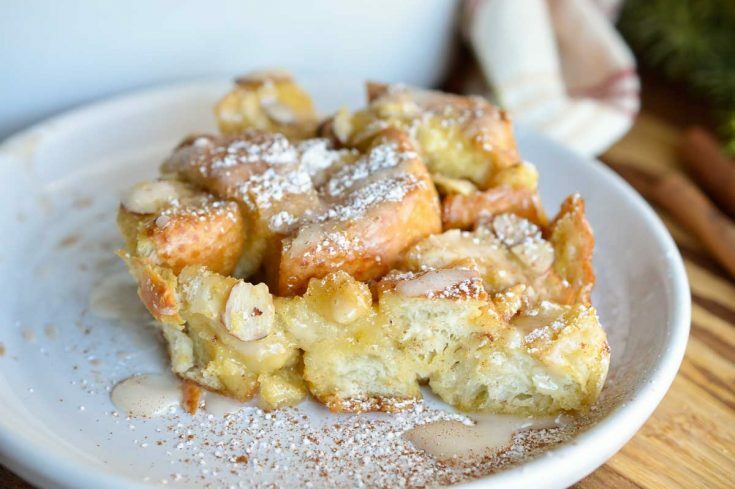 That is why french toast casseroles are so great. No need to stand over your stove flipping slices of bread while everyone else is relaxing or having fun. 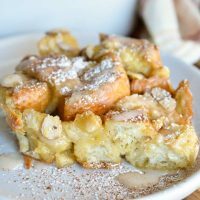 And this Dairy Free Egg Nog French Toast Casserole is perfect for feeding your hungry family this holiday season! Silk has a variety of seasonal flavors that are dairy-free and egg-free. Choose between Original Silk Soy Nog, Pumpkin Spice Silk Almond Nog or Original Silk Almond Nog. It is a great way to enjoy a traditional winter treat with less fat and calories! 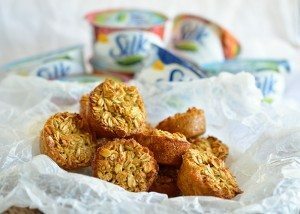 Visit www.silk.com/holidays for recipes, coupons and more! Almond and Egg Nog go together really well! I would’ve never thought to combine the two. 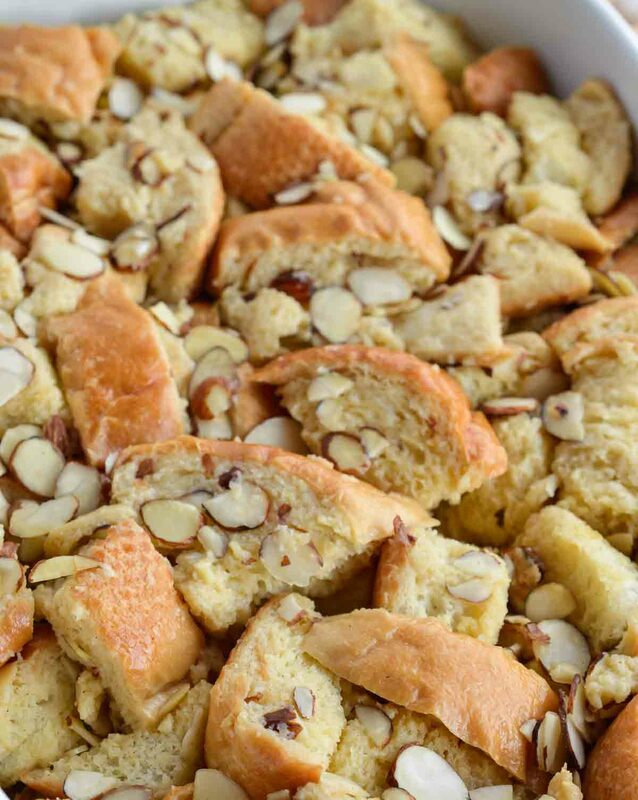 The almonds add flavor and crunch to this breakfast casserole. The glaze. Oh my. The glaze is absolutely amazing and brings this dish together. Don’t skimp on the glaze. I love all the nutmeg in holiday recipes. Why do I not use more nutmeg throughout the year? I should start. 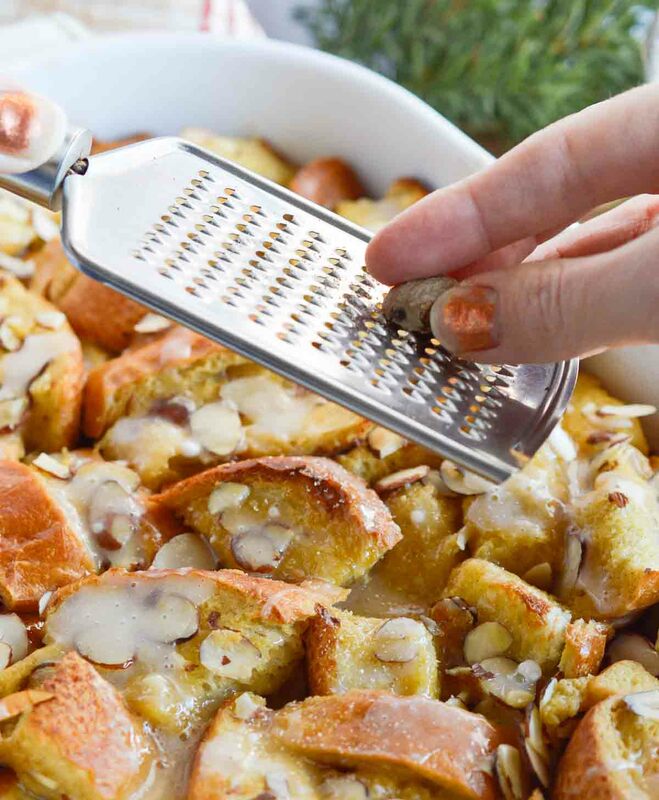 Fresh grated nutmeg takes this breakfast casserole to the next level. Now that is my kind of holiday breakfast! And this is what you get. A moist (but not mushy), soft, sweet, donut-like texture with a balance of egg nog and almond flavor. 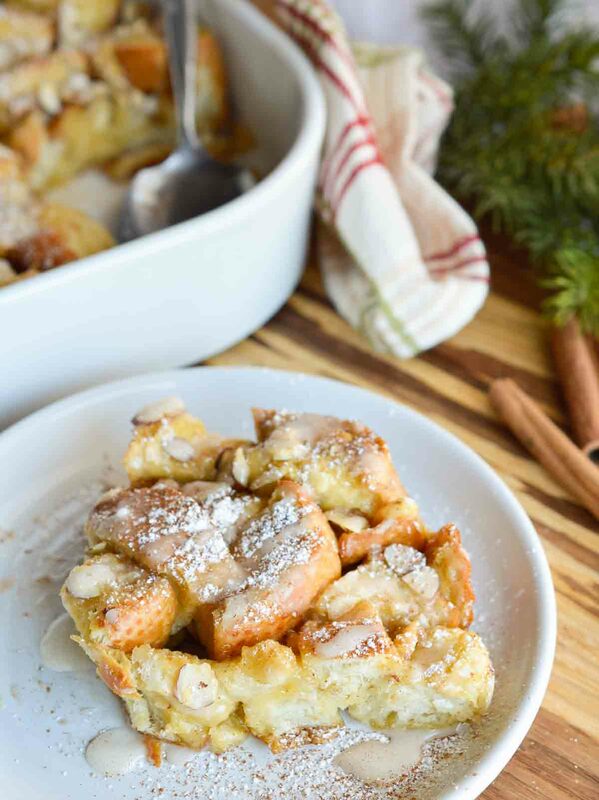 Get yourself a slice of this casserole and top with a dusting of cinnamon powdered sugar. Thoroughly mix Silk Almond Nog, eggs, brown sugar, cinnamon, nutmeg and salt. 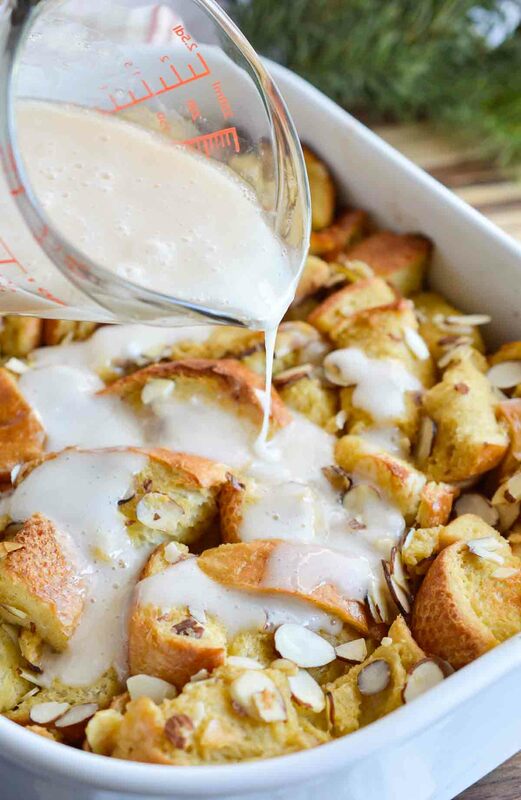 In large bowl; toss together bread cubes and almonds with nog mixture until evenly coated. Transfer to 9x11 baking dish sprayed with nonstick. Gently press down on bread cubes to flatten. Let sit 1 hour. Bake casserole for 20 minutes. Allow to cool slightly before glazing. Mix powdered sugar and Silk Almond Nog until smooth. 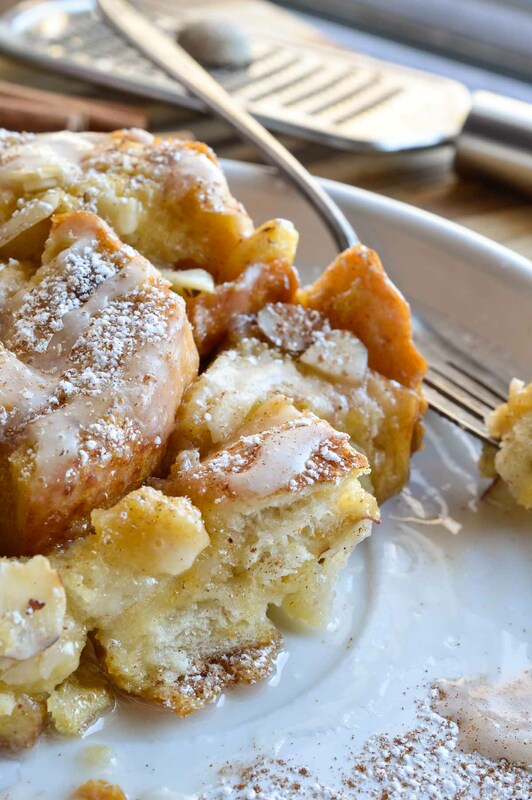 Drizzle over entire casserole or glaze each slice individually before serving. 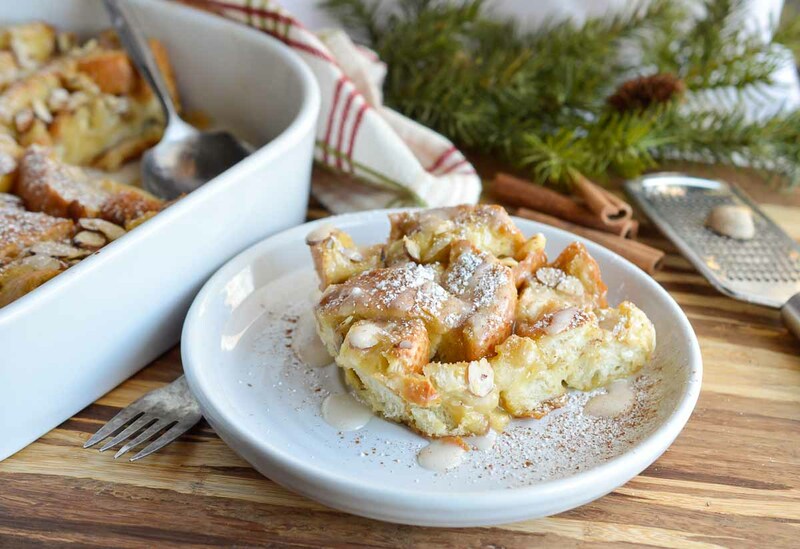 Serve casserole with a dusting of powdered sugar, cinnamon and fresh grated nutmeg. This casserole reheats in the oven very well. Reheat at 375°F for 10-15 minutes. More Easy Breakfast Options. . .
Love this recipe. We have a lot of company visiting over the holidays, so I’ll put this on my menu! What a perfect breakfast for Christmas morning! Yes! Pop this in the oven while you open presents. I seriously can’t WAIT to find this Silk egg nog, this will be among the first things getting made with it! 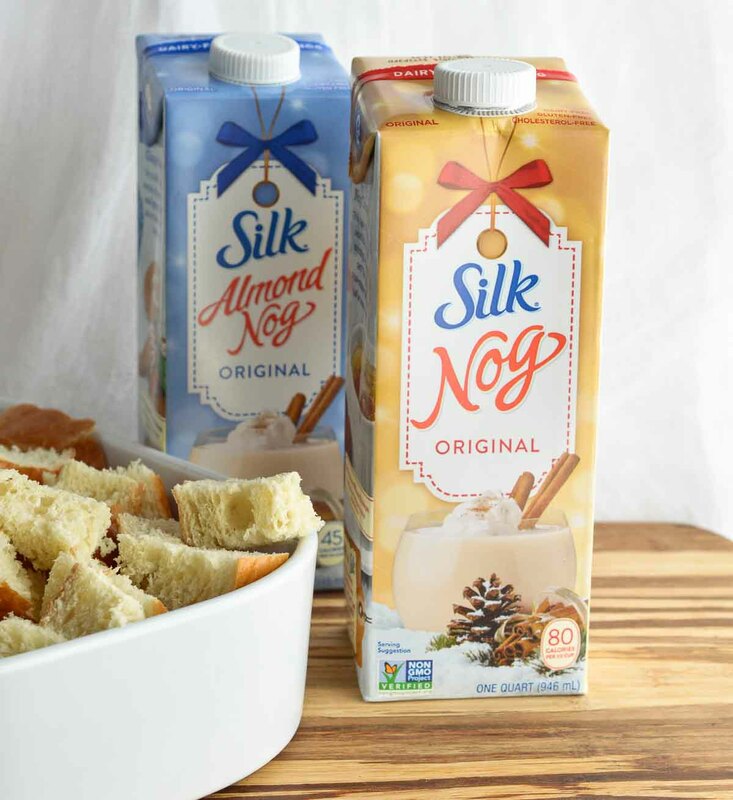 I love that we have fantastic dairy free options like this Silk Nog! is this something that can be prepped the night before and refrigerated, so it’s ready to pop into the oven in the am? This looks delicious! When you say a large loaf of French bread, can you tell me how many cups of cubed bread you mean or the weight of the loaf? I believe the standard store bought loaves are around 16 ounces. 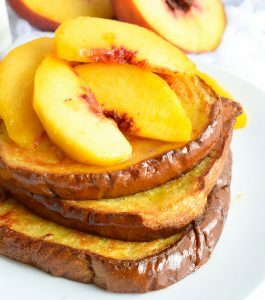 Has anyone successfully prepared this the day before and it taste okay the following morning? !